It weighed a ton. I knew for certain I caught something big when I felt a strong yank at the end of my line. I reeled it in as quickly but as carefully as I could while Dennis and his dad watched intently. We were on a boat in the Outer Banks fishing for sea bass on a glorious August day. As soon as I saw the young shark rise out of the deep turquoise water, I was simply overjoyed. I couldn’t believe I caught a shark in the Atlantic. I just caught my first blue crab the day before and there I was reeling in a shark. It was absolutely unbelievable. After Dennis snapped a few photographs, we hurled the shark right back in the water. 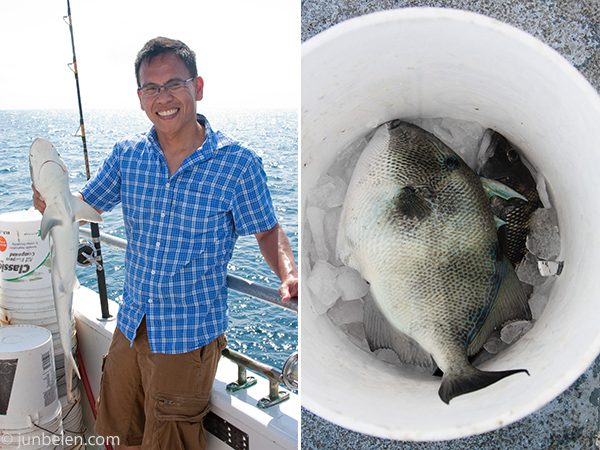 Shortly after, Dennis caught a sea bass that was big enough to keep and I got lucky once again and caught a huge trigger fish. We filleted and pan-fried them in olive oil and butter that evening for dinner. It may not seem like an exceptional haul but the thrill of catching a shark was simply incredible. While growing up, Dennis spent many summers with his mom and dad — Carol and Art — and his two older brothers — Tim and Brian — in the Outer Banks. They would drive from Warren, Ohio to the easternmost tip of North Carolina and spend a week camping in Cape Hatteras. They would venture out in the morning to fish, catch crabs or dig for clams and would take the day’s haul back to the campgrounds in the evening and make dinner together. Last August, Dennis finally took me to the Outer Banks where we joined his family for a week in the beach. I had never been to the Outer Banks before and was very excited. And it was a wonderful chance to be around family once more even for just a short time. We came up with a whole laundry list of must-do’s for the entire week. Climb the 257 steps to the top of the Hatteras Lighthouse. Visit the dunes at Kitty Hawk. Go fishing with Art. Go blue crabbing. 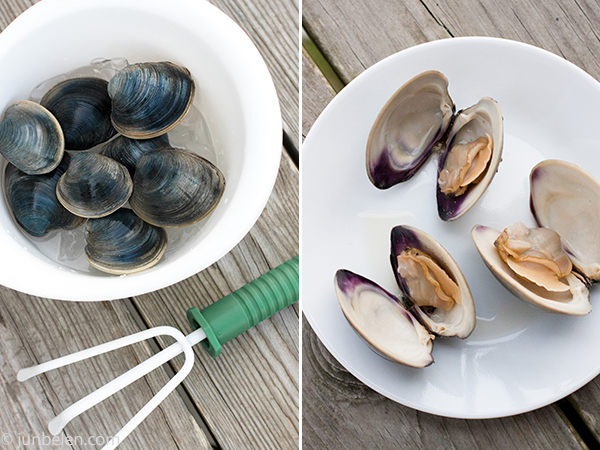 Go clamming. These must-do’s were, of course, on top of our plans for lounging on adirondack chairs and feasting on popcorn shrimp. I ticked off the items on the list one after the other and after our incredible day on the fishing boat, we only had one thing left to do: clams! And so, the morning after our fishing trip, we drove south along Highway 12 midway between Avon and Buxton in search of clams. We parked our rental in a beach access lot and then walked along the shore of the Pamlico Sound carrying a bucket, a bag of ice, and a small trowel and rake that we bought at the local hardware store. We picked a spot in the sound that was close to the edge of a grassy area and started digging for clams. We weren’t quite certain if it was the flimsy trowel or the spot that we picked but we just couldn’t find any clams! I started losing hope after an hour had passed and we had not found anything. Not a single clam. And, seriously, digging in the mud for clams was no mean feat. It was physically exhausting! Then, out of the blue, I heard Dennis yell out something. He found one, he hollered. At first, I thought he was just crying wolf but he held it up for me to see and its deep blue shell just glistened right before my eyes, I was extremely ecstatic. 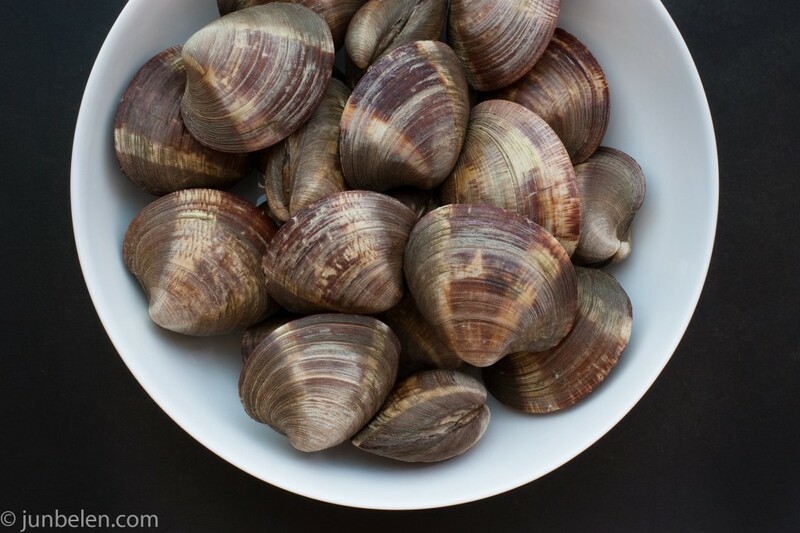 For some reason, I thought clams live in colonies like mussels do but, alas, they do not. It took us another couple of hours and a lot of patience to find more. The final clam count was eight. Eight beautiful bivalves. We proudly took them home that evening and steamed them in garlic and sauvignon blanc. Again, I was simply overjoyed. It was a truly memorable summer. It was memorable not only because I fished, crabbed, and clammed for the very first time but more so because I was able to catch a glimpse of Dennis’ childhood. It blows me away whenever I remember that Dennis and I crabbed in the exact same spot where he and his dad crabbed many years ago when he was a young kid. We tossed the bait into the water, reeled it in, and scooped the blue crabs out with a net in the exact same way they did years ago. It was magical. Truly memorable. To celebrate our wonderful summer, we browsed through our Outer Banks photographs once again last night and made white pizza with clams and pancetta from scratch. The first time I had white pizza was when I met Carol and Art for the very first time in Ohio for Christmas a few years ago. I remember being very nervous but once they welcomed like one of their own I instantly felt like I was home for the holidays. Making white pizza with littleneck clams, just like the ones we foraged in the Pamlico Sound, I thought, would be a fitting tribute to our memorable summer in the Outer Banks with the Allios. And why pancetta, you may ask. Just because bacon makes everything better, that’s why. 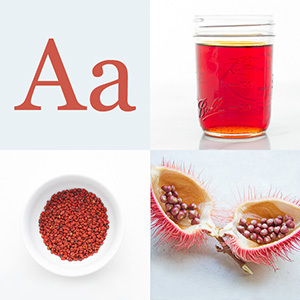 Dissolve the yeast completely in a large bowl by stirring it into 1/4 cup lukewarm water. When dissolved, in 10 minutes or less, add 1 cup flour and mix thoroughly with a wooden spoon. Then, as you continue to stir, gradu­ally add 1 tablespoon olive oil, 1/2 tablespoon salt, 1/4 cup lukewarm water, and 1 cup more flour. When putting in flour and water for the last time, hold back some of both and add only as much of either as you need to make the dough manageable, soft, but not too sticky. Take the dough out of the bowl, and slap it down very hard against the work counter several times, until it is stretched out to a length of about 10 inches. Reach for the far end of the dough, fold it a short distance toward you, push it away with the heel of your palm, flexing your wrist, fold it, and push it away again, gradually rolling it up and bringing it close to you. Rotate the dough a one-quarter turn, pick it up and slap it down hard, repeating the entire previous operation. Give it another one-quarter turn in the same direction and repeat the procedure for about 10 minutes. Pat the kneaded dough into a round shape. Film the inside of a clean bowl with 1 teaspoon olive oil, put in the dough, cover with plastic wrap, and put the bowl in a protected, warm corner. Let the dough rise until it has doubled in volume, about 3 hours. It can also sit a while longer. At least 30 minutes before you are ready to bake, put the baking stone in the oven and preheat oven to 450°. Sprinkle the baker’s peel generously with cornmeal. Take the risen dough out of the bowl and divide it in half. Unless both your peel and your baking stone can accommodate two pizzas at once, put one of the two halves back into the bowl and cover it while you roll out the other half. Put that half on the peel and flatten it as thin as you can, opening it out into a circular shape, using a rolling pin, but finishing the job with your fingers . Leave the rim somewhat higher than the rest. An alternate method — and the best way to thin the dough, if you can emulate it, is the pizza maker’s technique. First roll out the dough into a thick disk. Then stretch the dough by twirling it on both your upraised fists, bouncing it from time to time into the air to turn it. When it is the desired shape, put the circle of dough on the cornmeal-covered peel. In a small frying pan, heat the olive oil over medium-low heat. Add the garlic and cook until it just begins to sizzle, 2 to 3 minutes. Transfer the garlic oil to a bowl. Spread 1 to 2 tablespoons of the garlic oil over the dough, leaving a 1/2-inch border. Sprinkle generously with half of the rosemary, parsley, mozarella, pancetta and clams. Slide the pizza, jerking the peel sharply away, onto the preheated baking stone. Bake for 8 to 10 minutes. Turn the pizza 180 degrees and continue baking until the crust is golden brown, 8 to 10 minutes more. As soon as it is done, drizzle lightly with olive oil. While the first pizza is baking, follow the same procedure for thinning and topping. 1. If you don’t have a baking stone and a baker’s peel, a pizza pan or a simple baking pan will do. But remember to dust the pan lightly with cornmeal. 2. The pizza can also be grilled instead of baked. The cooking times may vary so check if the pizza is done instead of watching the time intently. 3. Guanciale is a great alternative to pancetta. What a great story! Love that you had a list of “dos” for the week – the best way to travel is to see and do as much as possible, I believe. Nicely done pizza and your photos are amazing!!! I envy you Jun! Look those wonderful ocean pictures. Growing up as “anak pantai” (the beach girl), I miss those moments. I LOVE that you’ve added a story behind your choice of ingredients. And wow: your photographs are amazing, as always. The bokeh behind the fish is stunning. Jun, your photography just kills me..slowly and painfully, I am struck in awe each time! I love it! And the pizza: divine to say the least! 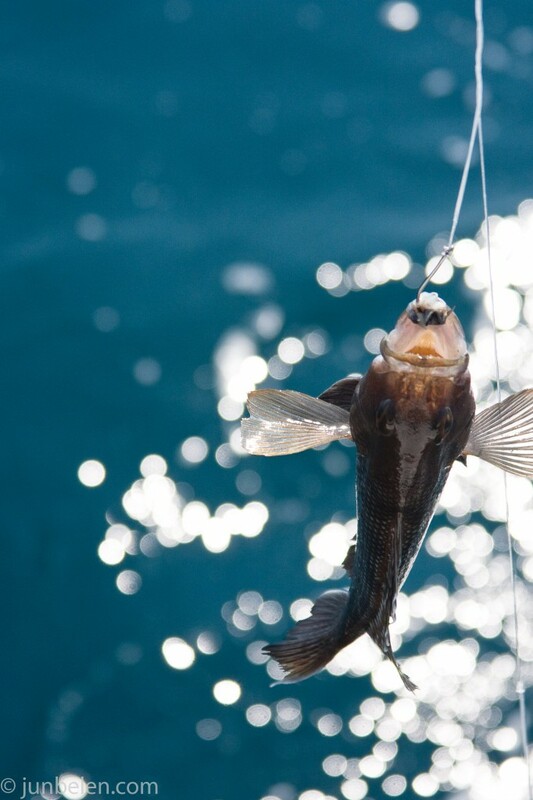 If I didn’t always get so sea sick, I really love to experience deep-sea fishing or at least go along for the ride. great post, and such gorgeous photographs! When my sister came back from Japan she raved about pizzas with clams. I’ve never had any but yours looks great. Maybe, I’ll find some clams and use your recipe to cook up a feast! Thank-you for the inspiration!!!! 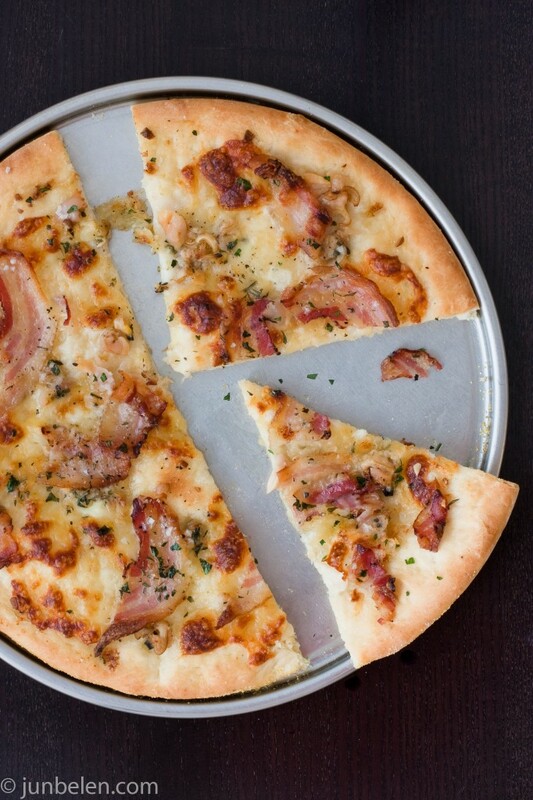 Jun – this is fantastic – I love the combination of clams and bacon – like a clam chowder but on pizza! Can’t believe you caught a shark! You know in the Philippines hindi natin pakakawalaan yan! Heehee! You are now my favorite. Congratulations. That picture of the fish is beautiful. And the pizza looks wonderful, even though I avoid clams. Wow, a shark! Bakit mo pinakawalan? Next time, shark pizza naman… Congratulations…Can’t wait to vote for you. 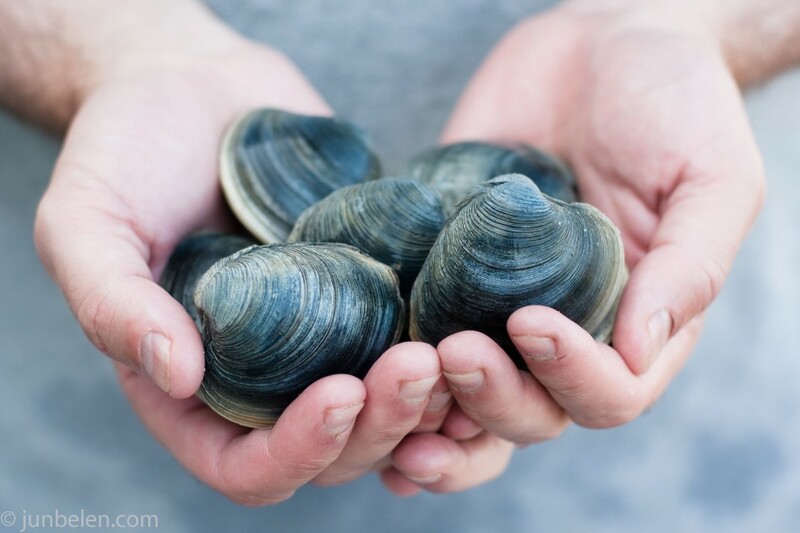 As someone who lived for a few years in New Haven, CT and would feast on clam pizza from time to time, these would fit right in next to a slice from Modern Apizza. And I think my stomach is on the verge of growling fiercely. All of these excellent entries are making me really sad that I won’t be in my kitchen for most of the weekend–I want to try so many of them!! Jun, I’m a fan. Of you, your story and your pizza. Even though I heard about your shark adventure on Twitter it was still fun to read it here, especially tying everything to this challenge. Well done again. I haven’t had white pizza in ages! Delicious! And with clams and pancetta, too? Oh dear me, even better. I love this pizza and love the story and photos even more. Clams and pancetta together is heavenly! what breathtaking photographs! and that pizza recipe sounds pretty darn delicious to boot. well done! I love clams on pizza. I love clams on anything. There is a local place around here that has clam pizza with white sauce, but I am pretty sure they used canned clams. You pizza looks awesome btw. Good luck and voted. dang dude, those action photos are gorgeous, what a fun time you must have had! I haven’t clammed since I was a kid either… anyways, the pizza looks good! As always, your photos are amazing. I really enjoyed hearing of your adventures and the story behind your pizza! Great pictures too! Your pizza looks really good – I like that you paired the clams with pancetta – great flavor. Best of luck! Such a great flavor combo, I’ll take bacon in clam chowder or clam and garlic pizza for lunch any day! Great story too! What’s cooler than catching a shark (other than catching two sharks)? Good luck this week! Your photos are so gorgeous! WOW! Jun, this is absolutely gorgeous! Thanks so much for sharing your summer memories and evoking the salty sea air with your photos and writing. I’ve never dug for clams before but now I’m very intrigued, especially if it means I get to use them in a pizza like that. By the way, I’m very glad that you didn’t forget the cardinal rule of cooking, the one about bacon. The OBX is my favorite place in the whole wide world. The minute I leave I start dreaming about the day I can return Cheers dude, you got my vote, your pizza looks beautiful…. This story reminds me a bit of One Morning in Maine, by Robert McCloskey, which I read to my daughter every few days. I love how vivid and personal this post is. Erin has been wanting to show me the Outer Banks for some time now, and I have to admit, it sounds very appealing! Thanks for sharing. Your beautiful photos and stories make me miss the ocean. I’ve never been to the Outer Banks and I hope to go someday! You accomplished a lot this summer, and the pizza looks incredible! You have a vote from me. Beauty of a fishing story — I think we both know that seafood is important on a pie!!! Oh my! This pizza sounds fantastic! I loved hearing about your summer and isn’t it the best when we can share in our loved one’s favorite pastimes? You’ve got my vote for sure Jun! I enjoyed reading about all you did over the summer. What a great tribute with the clams and pancetta pizza. The pictures are gorgeous and you’ve got my vote! This made me want to go to the Outer Banks and see and harvest the gorgeous foods you had. Beautiful photos and post as always. Thank you everyone for all your wonderful notes. Our summer in the Outer Banks was truly truly memorable. It was all about family and food, which made it really special. Many thanks again, everyone for stopping by my blog. Jun, I grew up not far from Dennis’s hometown, in Sharon, PA. And I vacationed in Duck, NC, the northern Outer Banks (and am dying to take Ben and Esme there). And I am going to make this pizza. Never have I seen more beautiful dunes, beaches, storms than in the Outer Banks. I can’t wait to meet in person one of these days and see more of your photos. They’re lovely and perfect.